Maco Pkg has been family owned and operated for over 80 years. Since 1942 we have earned our reputation as a supplier to multiple industries with quality pouches at competitive prices. In order to help you know how to choose packaging for a product, we offer our customers a diverse solution set for custom manufacturing of all types of bags and pouches. Our contract packaging services apply to beverages, liquid products, and dry food. Fueled by an engaged family/employee ownership, Maco specializes in enthusiastic and proactive support to all aspects of the packaging process. We’re located in Newark, New York and operate a modern, 250,000 square foot facility. We provide samples to ensure that we cover all the details in your project. You are always welcome to come and tour our facility! SQF 2000 Level 3, ISO9001:2008, Organic and Kosher. Packaging can be very complex. To ensure superior quality and customer service, it is important to make sure all of the available information is supplied in advance to facilitate and expedite the quoting process; we request that you assist us with completing the following questionnaire. Your Maco Pkg Account Manager can assist you with any questions that you may have. We are here to be your packaging experts. Our team is INTO IT! Into what type of packaging will this product go? Do you have a sample to send? Do you have or will you have detailed written quality specifications/requirements? Will you manage the supply chain or will you need sourcing? If the container is rigid, what type of label will it need? i.e. shrink sleeve or pressure sensitive label? What quantity will you be looking to run? Will MSDS, ingredients list and allergen statement available? Does the product make any claims? i.e. Organic, Kosher? How will we receive bulk product? Will we need to mix or blend ingredients? Is the product thermally processed? Are there any analytical, physical or microbiological testing requirements? What is your time table? Lead-times range from 2 weeks for smaller quantity, unprinted packaging, to up to eight weeks for printed, high quantity or engineering complex packaging. 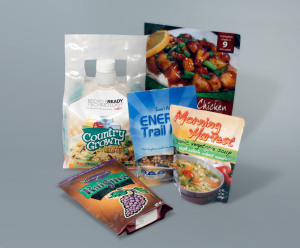 Pouches refer to flexible packaging that offer a barrier and bags typically refer to a polyethylene non-barrier specific application. Do you have a predetermined specific flexible packaging material? What quantity do you need? Large run? Small run? Do you have a specific barrier property you are looking to achieve? What product/industry will this packaging be used for? Are the contents of the package edibles or consumables? Is this a military application? If so, what is the MIL SPEC? What is the outside dimension(OD) and inside dimension(ID) of the pouch? Will the packaging need to be printed? Do you have developed art work in an AI Vectorized file? Flexible Packaging is non-rigid packaging structures used to package and protect various food and nonfood products in the retail and industrial business forum. Snacks and frozen foods, medical appliances, beverages, pet food, etc., are a sampling of products packaged in this medium. Converting is simply changing something into a different form. In the case of flexible packaging, converting would be the process of forming films, foils and resins into a multi-layer structure through the process of lamination. What is LLDPE and how does it differ from LDPE? LLDPE stands for linear low-density polyethylene and is a substantially linear polymer (polyethylene). LLDPE has higher tensile strength and higher impact and puncture resistance than LDPE. It is very flexible and elongates under stress. It can be used to make thinner films, with better environmental stress cracking resistance. It has good resistance to chemicals and to ultraviolet radiation. What is MVTR and OTR? MVTR stands for moisture vapor transmission rate, or the rate at which water vapor passes through a substance. OTR is Oxygen Transmission Rate, or the rate at which oxygen passes through a substance. MSI stands for Thousand Square Inches. What is the difference between extrusion coating and adhesive coating? Extrusion coating is the coating of a molten web of synthetic resin on to a substrate material. The actual process of extrusion coating involves extruding resin from a slot die at temperatures up to 610°F/320°C directly onto the moving web which is then passed through a nip consisting of a rubber covered pressure roller and a chrome plated cooling roll. The latter cools the molten film back into the solid state and also imparts the desired finish to the plastic surface. Adhesive coating is the coating of an adhesive (a mixture in a liquid or semi-liquid state that adheres or bonds items together) to a substrate material. Reverse printing is the process of printing on the back side of a clear substrate, sometimes referred to as subsurface printing, with a reverse image. In the process of manufacturing flexible packaging the print will be buried between the outside substrate and the rest of the structure, offering scuff and chemical resistance. When the outer substrate is mounted to the remainder of the structure, it will be right reading. What is the difference between flexographic printing and rotogravure printing? Flexographic printing is the method of printing on a web press using rubber or photopolymer plates with raised images. Rotogravure printing does not use plates, rather the image is etched directly onto a cylinder. It can be distinguished when looking through a loop – it has teeth like marks around type and solids. * a coating applied to film – verses extruded resin, blend of resins, or a coex. Examples are not limited to these structures.